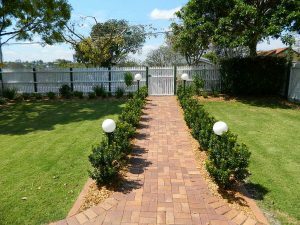 North Brisbane Paving and tiling landscapers. Paving/tiling adds an elegant style to your landscape design and can complement the architecture of your home and is usually a top priority for many new homes or home renovations. Residential driveways, pool areas and outdoor living areas can offer an exterior design feature which compliments your home with low maintenance. There are many choices of material available now, including natural stone flags, man-made slabs, slate pavers, bricks, and concrete pavers to name a few. Terry from Brisbane Home Landscaping can help you choice the best product for your project, he considers surfaces, aesthetics of your home, surroundings in the yard as well as safety for your family (small children or elderly) and creates an artwork to enhance your home and provide a low maintenance solution for your yard. Pool surrounds are a must for any new or renovated projects. 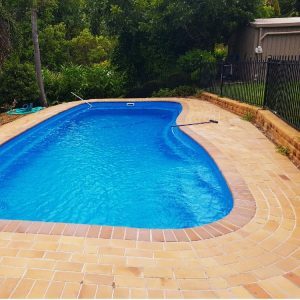 Practicality and style are a big consideration when it comes to paving your pool areas and the team at Brisbane Home Landscaping are specialists at creating beautiful fresh pool areas. Paving your driveway can make an impressive statement to your front facade of your home. Paving is a durable and quality driveway option which will last for many years with very little maintenance. Paved or tiled patio areas will give you a long lasting and maintenance free area to entertain your family and guests for many years. Consider boarder and feature pavers or tiling work within your design to add depth. Adding paved steps or stairs to your landscape project can also add depth and visual aesthetic to your home or garden. 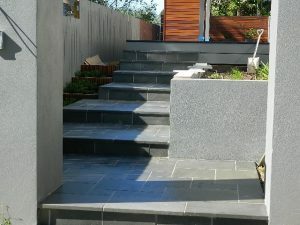 Modern landscape suppliers now have offer an extensive range of pavers and tiles in a variety of colours and sizes which are perfect for creating this visual element to your landscape both for practicality and longevity and Brisbane Home Landscaping know just which pavers or tiles should be used for your individual design. North Brisbane Suburbs including; Carseldine, Bridgeman Downs, The Gap, Samford, McDowall, Albany Creek, Ascot, Lutwyche, Albion, Clayfield, New Farm, Newstead, Grange, Wooloowin, North Lakes, Petrie, Warner, Red Hill, Ashgrove, Paddington, Kelvin Grove, Ascot, Nundah, Chermside, Sandgate, Newport, Scarborough, Redcliffe, Bald hills, Eatons Hill and many more. Call Terry on 0418 157 350 for more information!